Posted on 28, August 2017 by EuropaWire PR Editors | This entry was posted in Automotive, Germany and tagged The sixth generation Volkswagen Polo, Volkswagen Polo. Bookmark the permalink. Optimised package due to MQB:Longer and lower in height than the previous generation, the new Polo is also larger inside. Length: 4,053 mm (+81 mm), wheelbase: 2,548 mm (+92 mm), cargo capacity: 351 litres (+71 litres). Natural gas for the first time: The engines output between 48 kW / 65 PS and 147 kW / 200 PS. New highlight in the Polo: TGI (natural gas) with 66 kW / 90 PS. Progressive compact car. The Polo, which has sold more than 14 million units worldwide, is a giant among small cars. Now a completely redeveloped sixth generation has arrived. Pre-sales of the best-seller have already started in the first European countries. Standard on every model: four doors and the area monitoring system Front Assist with City Emergency Braking and Pedestrian Monitoring as well as the Automatic Post-Collision Braking System. The Polo, which has been upgraded comprehensively, is now less expensive when price-adjusted for added features. 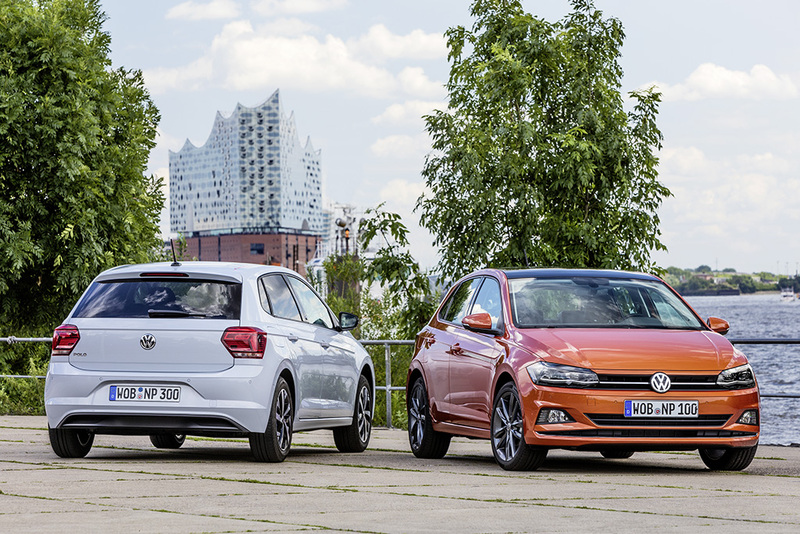 For example, in Germany the well-equipped basic model costs 12,975 euros (Polo 1.0 Trendline with 48 kW / 65 PS1). The sixth generation Polo’s concept and configuration are a reflection of automotive progress and the new status quo among compact automobiles. Four trim lines form the basis for the new Polo configuration: Trendline, Comfortline, Highline and Beats (which includes a 300-watt sound system). Following on from these, towards the end of the year will be the next Polo GTI2. Three high production volume engines at market launch. Customers of the sixth generation Polo will, in time, be able to choose from a total of nine efficient petrol, diesel and natural gas engines. The three powerplants that can be ordered at market launch are three-cylinder petrol engines at the three most popular output levels: two 1.0 MPI engines, one with 48 kW / 65 PS1 and the other with 55 kW / 75 PS3 as well as a turbocharged 1.0 litre TSI with 70 kW / 95 PS4. All models are equipped with a stop-start system and a regenerative braking mode. It is possible to combine a dual clutch gearbox (DSG) with any engine with a power output of 95 PS5 or more. Another important aspect for buyers of the new Polo who drive it in personal or business use is that all three engine versions offered at market launch attain best-in-class figures for comprehensive insurance classifications and cost of ownership. Six more engines by the end of the year. Six additional engine options will be introduced in stages by the end of the year: three petrol, two diesel and one natural gas engine. The petrol engine range will be completed by a 1.0 TSI with 85 / 115 PS2 and the further developed 1.5 TSI ACT with 110 kW / 150 PS2 and Active Cylinder Management (cylinder shut-off). The top petrol engine will also follow by the end of the year: a potent 2.0 TSI with 147 kW / 200 PS2 in the Polo GTI. Another new development is the first natural gas engine of the Polo: the 1.0 TGI with 66 kW / 90 PS2. The engine range will be rounded out by two efficient diesels: the two 1.6 TDI engines deliver 59 kW / 80 PS2 and 70 kW / 95 PS2 respectively. Four equipment versions and three packages. The new Polo is launching in the three trim core lines: Trendline, Comfortline and Highline, and as a ‘Beats’ special edition. The Polo Beats brings a 300-watt sound system and various customised features on board that were developed jointly by Volkswagen and US-based audio specialist Beats. Another version heading towards the starting flag is the Polo GTI, which will follow at a later stage. Even the base version, the Trendline, is well equipped: now included as standard are such features as rear doors, LED daytime running lights with Coming Home function, a speed limiter, the Automatic Post-Collision Braking System and the Front Assist area monitoring system with City Emergency Braking and Pedestrian Monitoring. Four fields of innovation. The new Polo was created under the motto: “We make the future real” – the idea that guides the Volkswagen brand strategy. It defines progressive parameters for each and every Volkswagen. The new Polo is the first model to be created based on this strategy and is now launching in production. The Polo development and design teams addressed the brand strategy’s four fields of innovation: Automated Driving, Intuitive Usability, Connected Community and Smart Sustainability. The teams used these fields of innovation to develop the DNA of the new Polo. Connected Community. Volkswagen is connecting people, cars and the environment more intensively than ever. The new Polo illustrates this very well. Interfaces for integrating smartphones such as App-Connect (with MirrorLinkÒ, Android Auto™ and Apple CarPlay™) are being supplemented by Volkswagen Car-Net which adds the various online services of ‘Guide & Inform’. These include online traffic information and information on filling stations and parking places. 1Polo 1.0 l 48 kW fuel consumption in l/100 km: urban 6.0 – 5.9 / extra-urban 4.1 / combined 4.8 – 4.7, CO2 emissions in g/km: 110 – 108 (combined). Efficiency class: B. 2The vehicle has not yet gone on sale and therefore Directive 1999/94 EC does not apply. 3Polo 1.0 l 55 kW fuel consumption in l/100 km: urban 6.0 – 5.9 / extra-urban 4.1 / combined 4.8 – 4.7, CO2 emissions in g/km: 110 -108 (combined). Efficiency class: B. 4Polo 1.0 TSI 70 kW fuel consumption in l/100 km: urban 5.6 – 3.8 / extra-urban 3.9 – 3.8 / combined 4.5 – 4.4, CO2 emissions in g/km: 101 (combined). Efficiency class: B. 5Polo 1.0 TSI 70 kW (DSG) fuel consumption in l/100 km: urban 5.8 – 5.7 / extra-urban 4.1 – 4.0 / combined 4.7 – 4.6, CO2 emissions in g/km: 107 – 105 (combined). Efficiency class: B.